Together with the Global Nuclear Initiative, GSF hosted a debate on the future of nuclear power and the lessons learnt from Chernobyl on Tuesday 17th May. 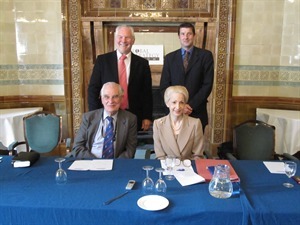 The debate was chaired by Lady Barbara Judge CBE and the panellists were Lord Oxburgh of Liverpool and Antony Froggatt of Chatham House. Antony Froggatt questioned the role that nuclear could play in today’s energy mix, examining risk issues, such as the age and siting of reactors; and containment. He concluded that while all energy sources had risks associated with them, how that risk was calculated and what it meant should militate against the use of nuclear power. By contrast, Lord Oxburgh concluded that if the Government wished to include nuclear energy as a low carbon source of background baseload, that was neither ‘a stupid nor irresponsible decision’, but a reasonable thing to do a part of the Government’s commitment to reduce carbon emissions.